The title is evocative, and immediately sets up a conflict that boils down to "us vs them." What kind of story is THEY'RE NOT LIKE US? Did you bat around any other titles for the series before settling on this one? 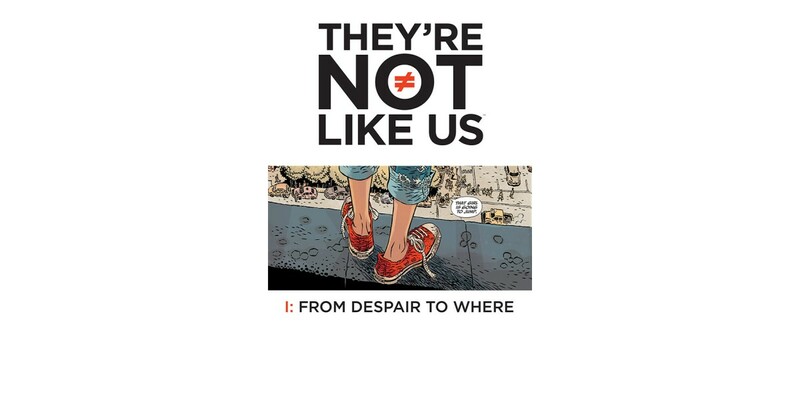 No, I was pretty much sold on THEY’RE NOT LIKE US as a title right away, and after coming up with the idea of doing a slow-building horror story about adolescents with super powers, it just seemed to fit perfectly. So many comics over the past several decades have dealt with the positive aspect of super powers, with people gaining or being born with amazing abilities and then deciding to use them for the greater good, but as fun as that stuff is, it’s a myth, a lie. People use their talents, whatever they may be, to get ahead in life. Typically, that results in people doing positive things in life — becoming a professional athlete, a scientist, a singer, a musician—but there are also people who realize they’re good at something and instead of applying their talents in a positive manner, go the other direction. Not every strong guy wants to work on a building site, you know? Sometimes if you’re strong enough or fast enough or smart enough, you decide it would be easier if you just took from everyone who is weaker, slower, and less intelligent. Power does different things to different people, and in THEY’RE NOT LIKE US, we’re going to meet a group of very desensitized young people whose extraordinary abilities have put them in a very unique position within the modern world. You're working with Simon Gane, who has drawn everything from Godzilla to post-Katrina New Orleans. What does he bring to the book? How did you get connected with him? Simon is so awesome, I keep pinching myself because I can’t believe how lucky I am to be working with him. And “luck” really is the operative word here. When Declan Shalvey suggested I approach him about working with me on THEY’RE NOT LIKE US, I assumed there was no way he was available, but he was really enthusiastic about coming on board, right from the start. In terms of what he brings to the book... Well, I knew I wanted the series to be set in San Francisco, and that means drawing lots of different types of architecture. Simon absolutely KILLS when it comes to drawing detailed cityscapes, and not only that, but he does it with such panache. There are things he’s done so far that involved a bit of photo reference, but even though he totally captured the place in question, he did it in a way that is unmistakably him. There’s an establishing shot of a house in issue one that is something I’d happily put on my wall at home—just such a great piece of drawing—and as if his draftsmanship on its own wasn’t amazing, his sense of character is even better. I always feel like I connect with the characters I’m writing a bit better after they’ve been designed and I can see them, but with THEY’RE NOT LIKE US, I really feel like I know these kids. There’s such subtlety of expression in Simon’s work, and I think his whole approach really underscores the value of truly great artwork in comics storytelilng. The chapter titles for THEY'RE NOT LIKE US, "From Despair To Where" and "Black Holes for the Young" feel almost like song or album titles to me. Is there a musical or other pop cultural influence on THEY'RE NOT LIKE US? Oh, they’re song titles, and there will be some pop culture references over the course of the series, but not to the same degree as some of the things we included in NOWHERE MEN. Every issue has a quote that pertains to the story in some way, and a few of them are from songs as well. The first one is a line from a Manic Street Preachers song called “Motown Junk” that kind of sums up the attitude of the characters in the book: “Twenty-one years of living and nothing means anything to me.” The second issue is a Morrissey lyric—“Is evil just something you are, or something you do?”—and if pressed, I’d say that one question probably gets to the heart of this series quicker than anything else. The covers you've revealed thus far are almost comics panels on their own, and both hint at trouble to come, but also give us a glimpse of the cast. Where did this approach to the covers come from? It’s partly a tip of the hat to what Alan Moore and Dave Gibbons were doing with the covers to Watchmen, but it’s also inspired by some old record design work that I liked. There’s been a lot of great graphic design applied to LP and single covers over the years, and since records are such a big part of my life, it’s pretty difficult for that stuff not to bleed into my work. It also helps that I’m able to work with Steven [Finch, also known as Fonografiks], because when I have an idea for something, I know he’s not only going to be able to get what I’m going for, but he’ll be able to take it to another level. One of the big things that we are trying to accomplish here is to consolidate as much information as possible onto the front cover. Credits, indicia, barcode — all of that stuff is at the bottom of the front cover. That makes it possible for the entire inside of the book to be given over to story content, and since panel one is on the cover, it’s basically going to be 23 pages of story, from front cover to to inside back cover. Is THEY'RE NOT LIKE US a finite series, or an ongoing comic? It’s finite in the sense that I have an ending in mind, but how long it takes to get there remains to be seen. Part of that is down to readers' response, obviously—if people like the book, then we’ll see where we can take it before getting to that final scene I have locked away in the back of my mind. If they don’t, then we won’t overstay our welcome. Working on the business side of things in comics, you get pretty pragmatic about things like that. A book either succeeds or it doesn’t, and it’s good to know when to move on to the next thing. I’ve always admired the fact that Robert [Kirkman] was able to do that early in his career. People look at the success of THE WALKING DEAD as though it was a given, but he did a number of books before that and INVINCIBLE took off for him—BATTLE POPE, CAPES, TECH JACKET, CLOUDFALL —and when they weren’t successful, he quickly moved on. I think there’s a lot we can do with THEY’RE NOT LIKE US, though, so hopefully, we’ll be able to keep at it for a while. The scheduling on NOWHERE MEN has been an issue. Can you address that, and how your experience there affects the scheduling on THEY'RE NOT LIKE US? I hate talking about this, because I don’t want to sound like I’m throwing anybody under the bus, but since Nate [Bellegarde] opened up about the delays on NOWHERE MEN over the summer, it probably doesn’t hurt to say that the biggest difference here is that Nate’s not drawing THEY’RE NOT LIKE US. What happened with NOWHERE MEN was pretty disheartening, but hopefully, Nate will take the time to get better and eventually be in a place where he can start doing comics again. I’d definitely like to do more NOWHERE MEN with Nate at some point in the future, but right now, it’s just not an option. I tried working with a couple different artists on the book after it became clear Nate couldn’t continue, and it just didn’t work. NOWHERE MEN is Nate, Jordie, Steven, and myself, and just swapping in another component could never be a solution. People still write me and ask if and when the book is coming back, but it’s really out of my hands at the point. Meanwhile, Simon is cruising right along on THEY’RE NOT LIKE US, so it’s just a completely different situation altogether.